The two old ladies in the boarding lounge have bizarrely nice things to say. Usually a couple of yentas on a 6am flight aren’t exactly extolling the virtues of anything, much less an airline. But as I’m waiting at gate B6 at the Fort Lauderdale airport, there’s an unusually positive vibe. Really, guys? Y’all are getting excited like the dealer just showed up to an after-party. The best I’ve ever heard someone talk about an airline is that Delta had a pretty decent turkey wrap and Spirit “wasn’t that bad.” But mention Southwest around the right people and you’ll be subjected to superlatives usually reserved for ESPN discussing the SEC. With no meals, no TVs, no first class, and no presence in online search engines, Southwest's cult following must run deeper than amenities. 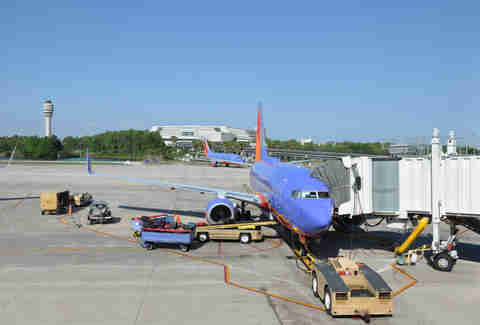 Not that this morning flight from Fort Lauderdale was my first experience with the cult of Southwest Airlines. But it got me wondering what this airline is doing to breed that kind of loyalty in a continually commoditized industry. 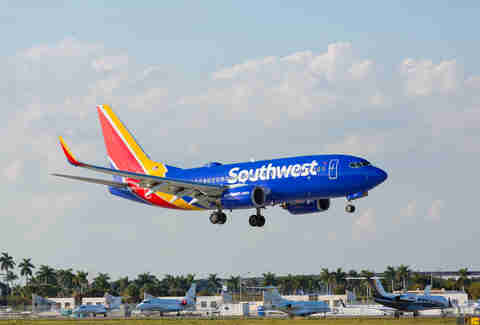 With no meals, no TVs, no first class, and no presence in online search engines outside its own, Southwest’s cult following must run deeper than amenities -- by number of annual passengers, Southwest is now the world’s third-largest airline, after only American and Delta. The more I scratched at the question, the more I think it’s about keeping employees happy, who in turn keep customers happy, in ways other airlines just don’t. Southwest Airlines was born in Texas. And if you know anything about Texans, you know they do things their own way. This is why even in its early days Southwest didn’t act like other airlines. Its early ads featured flight attendants in miniskirts and hot pants, at a time when airlines rarely advertised with anything other than men in suits. It advertised on low fares and no frills, even before airline deregulation made price competition the norm. That “we-do-it-our-way” attitude has persevered. They never assign seats. They let flight attendants go off-script. They avoid online search engines. They still serve peanuts, even. Does Southwest’s quirks irk some people? Sure. But for every passenger who complains, a dozen sing Southwest’s praises. Another thing Texans love: freedom. Whether that’s freedom to own enough rifles to outfit the Canadian biathlon team or freedom to change your flight whenever you cot-damn feel like it, Southwest embraces the Texas ideal of doing what you want when you want. There’s no charge to change a flight. So if you, like Los Angeles travel agent Lisa Niver, found that you’d booked a ticket in the wrong direction for a professional conference, you can change it without coughing up a $200 fee. When she realized the day before said conference she’d bought a ticket from Phoenix to LA instead of the other way around, she rebooked at the last minute at no extra cost. Also, your first two pieces of checked luggage are free. Ain’t nobody telling a Texan how much he can pack. Despite not charging all those fees, since 1990, Southwest is the only major airline not to declare bankruptcy or go out of business. Damn, says every business school textbook written over the past 25 years. How’d they do that? The popular answer during the fuel crisis of the late 2000s was that Southwest had hedged its fuel. That is, it prepaid for obscene amounts of jet fuel at a low price, so it wasn’t nearly as crippled when oil prices spiked. But that crisis is long gone, and Southwest is still making money, reporting a handsome $1.9 billion in net income for the fourth quarter of 2017 alone. Southwest keeps the cash registers rolling with business practices that other airlines don’t embrace. Southwest owns all its planes and uses them efficiently. For example, their gates at Dallas Love Field Airport see 10 to 12 flights per day. That’s about double what American does down the road at its hub at DFW. Southwest also effectively has only one kind of plane -- the Boeing 737. That means lower maintenance costs with better purchasing power for parts and fewer planes to train staff on. But the main reason Southwest makes so much money is because people love working there. Unlike much of corporate America, it realizes happy employees will make you money. Southwest has never laid off or furloughed an employee. Ever. That’s almost unheard-of for any company its size, unprecedented for a large airline. When you have that kind of job security, you can do things for passengers like give them free drinks, or hold fake wedding ceremonies in the aisles. Those shareholders pocketed a tidy $274 million in dividends and $1.6 billion in share repurchases last quarter. The benefits of happy, empowered employees extend beyond just free drinks. Reservation agents can, as they did for Mariah Muhlbradt of Boulder, Colorado, even waive large differences in base fare if you, say, booked a ticket on the wrong date for your best friend’s wedding, and only realize it the day before, when all the available flights are $500 more expensive. At first glance, it might seem cutting customers big breaks for their own errors isn’t good for business. Instead, it breeds loyalty, which drives profits. And when we asked a handful of flight attendants what they’d do to improve the airline industry, they all agreed that giving passengers increased flexibility to change or cancel a flight -- as Southwest has done -- would go a long way in improving the flying experience as a whole for customers and FAs alike. Most everyone you encounter on a Southwest flight is, at the very least, in a pleasant mood. Most are downright friendly. Truthfully, I never talk to people on planes, but when flying Southwest for a month to assess the difference, that changed whether I liked it or not. On my first flight, I passed the time chatting with an off-duty flight attendant headed to Turks and Caicos. On my way home from New Orleans, a nurse from Boca Raton spent the entire flight detailing all the places she’d traveled via cheap fares on Southwest. Even though the in-flight Wi-Fi was only $8, people were actually engaging with other people rather than staring at a screen. My New Orleans-to-Fort Lauderdale seatmate wasn’t the only person who enjoyed extolling the virtues of Southwest. Carole Terwilliger, a grandmother from San Francisco, told me how Southwest’s senior rate and flexible change policy allowed her to visit her grandchildren in New York, and stay as long as she wanted. “You never know for sure when a baby will decide to be born,” she said. Mickela Mallozzi, who produces and hosts a travel series for PBS in New York, told me Southwest helped save her marriage to her Nashville-based husband. They’re able to meet each other in different cities and change reservations as needed, as well as rack up free flights using the airline’s credit card. So it’s not all honey roasted peanuts and sunshine aboard Southwest Airlines. 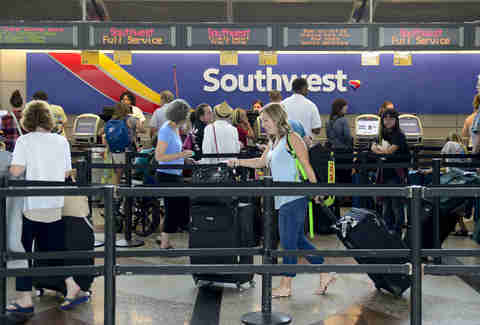 While nobody is complaining about free checked bags, some of Southwest’s quirks turn people off. The process he’s referring to is Southwest’s policy of open seating, wherein you’re assigned a boarding group A, B, or C, and then a number within that group. You board in order, and choose the first available seat you like. Many refer to this as a “cattle call,” although anyone who’s seen Group 9 crowd around an American Airlines gate during pre-boarding knows it’s more a matter of herding cattle versus letting them run free. Boarding is the most-cited discrepancy with Southwest, even though the process is on average 25% faster than traditional methods. Southwest also has nonstop routes nobody else has. Which is great for people looking for nonstops from Baltimore to Albuquerque, on a plane that continues on to Santa Ana. Not so much for folks who want to fly from DC to LA and not have to stop in New Mexico. Southwest also doesn’t show up in travel search engines, a turnoff to many who don’t like to multi-stop shop when looking for flights. While quantifying an “experience of positivity” is tough to do, breaking down a Southwest flight versus a legacy carrier with fees is easy. Looking at a weekend flight from Seattle to LA in April, most legacy carriers had nonstop flights around $280. Even with two checked bags that would be $330. Southwest was mostly over $400, with stops. On that same weekend, nonstops on legacy carriers from New York to Atlanta were around $290. Southwest was $270 -- cheaper overall. Though Southwest was once THE low-fare airline, that’s not always the case anymore. But it still maintains a loyal following, drawing people willing to pay more for what the airline offers. 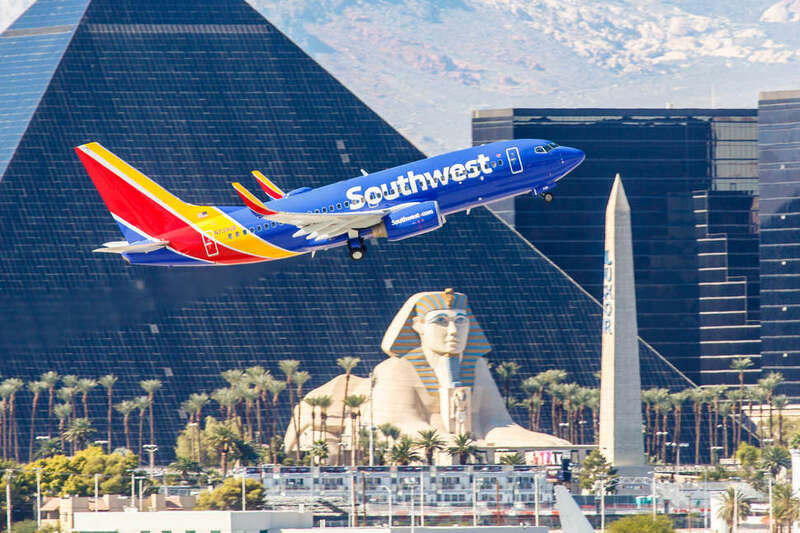 In creating an environment in which rules can be skirted for customer happiness, and personality is prioritized over protocol, Southwest has created customer loyalty in a way no other airline has. Free bags are just the start. It’s a matter of creating a feel from the top down that flying should be fun. And for those few hours you spend in that big purple plane, it tends to be. Matt Meltzer is a contributing writer at Thrillist who would like to remind his friends flying to Miami that Southwest only flies to Fort Lauderdale. And friends don’t ask friends for rides to Lauderdale. Follow him on Instagram @meltrez1.